London and Overseas is one of the 21 Areas that make up NAFAS. We provide clubs that hold monthly meetings, workshops, seminars and other events. 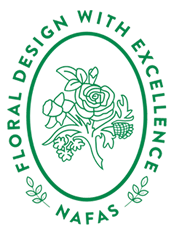 We regularly compete at the RHS Chelsea Flower Show and RHS Hampton Court Palace Flower Show. Our work can be seen at many other shows and events. As primarily a charity we regularly support good causes and national campaigns.